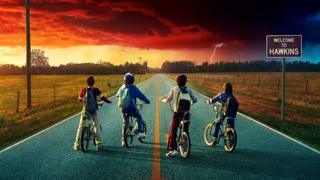 Good news, Stranger Things fans: twin creators Matt and Ross Duffer have confirmed there will be a third series. Now here’s the not-so-good news. The Duffer brothers don’t have any plans to extend it beyond a series four. “We’re thinking it will be a four-season thing and then out,” said Ross Duffer in an interview with Vulture. The second series of Netflix’s ’80s-set supernatural smash, about kids probing strange goings-on in their Indiana home town, launches on 27 October. It follows a hit first season that revolved around the disappearance of one girl and the arrival of another – named Eleven – with special abilities. The show won an outstanding ensemble performance prize at this year’s Screen Actor Awards and is up for 18 more awards at this year’s Emmys. It has also revived the career of Winona Ryder, whose role as single mom Joyce Byers and meme-worthy antics at the SAGs have seen her Hollywood profile soar. Speaking to Vulture, the Duffer brothers said Season 2 will be “a little bit bigger” than its predecessor. “We wanted to push things a bit,” Ross is quoted as saying. Streaming giant Netflix has faced criticism recently for allegedly padding out its shows to inordinate lengths – a tendency that helped to coin the phrase “Netflix bloat”. ← Jollof rice: West Africa’s culinary king?